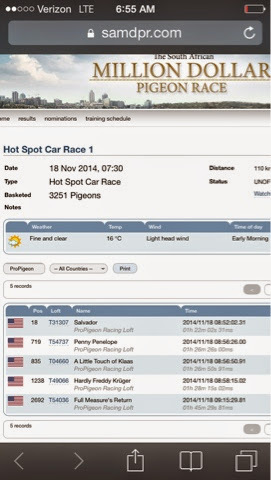 SAMDPR - Hot Spot Car Race One: 18th Open, 5th US vs 3,251 with 'Salvador'. We had a good day in the nominations, finally picked the right bird! Copyright © 2012 - 2013 ProPigeon Racing Loft. All Rights Reserved. Watermark theme. Powered by Blogger.